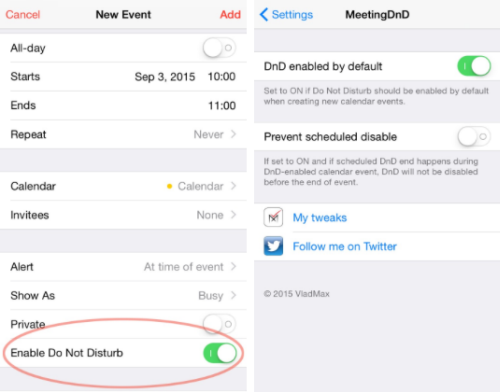 Do Not Disturb (DnD) mode can help minimize distraction and noise from the iPhone at specific times. By default, DnD can only be scheduled for Quiet Hours during one time period per day. The jailbreak tweak MeetingDnD vastly expands the utility of iOS DnD by enabling silence automatically based on events scheduled in the Calendar. This means the iPhone will automatically enter DnD mode during important meetings or at other predefined times during the day. Once installed, MeetingDnD can be enabled for specific Calendar events. Options also make it possible to enable DnD by default when new events are created, or to prevent DnD mode from switching off while a Calendar event is in progress. Since MeetingDnD supports recurring events, custom DnD times can be defined for multiple periods each day, week or month as desired. When the configured events end, DnD mode is switched off, with notifications and sound returning to the normal setting. Last but not least, MeetingDnD runs $1.99 on the Cydia app store. This entry was posted in iPhone, News and tagged Calendar, calendar events, Do Not Disturb, iPhone, meeting Dnd mode by IosdroneD. Bookmark the permalink.